We regret to inform you that due to circumstances beyond the control of both CNY SCCA and Pineview Run Auto & Country Club, our event scheduled for Sunday, July 22, 2018 has been cancelled. Refunds are being processed now. This cancellation does not affect any of the other events on our schedule. We look forward to your attendance at a future event. We apologize for the inconvenience and thank you in advance for your understanding. Note: This Saturday's (January 20th) rallycross, originally scheduled to be at Walczyks Farm, has been moved to Central NY Raceway Park. 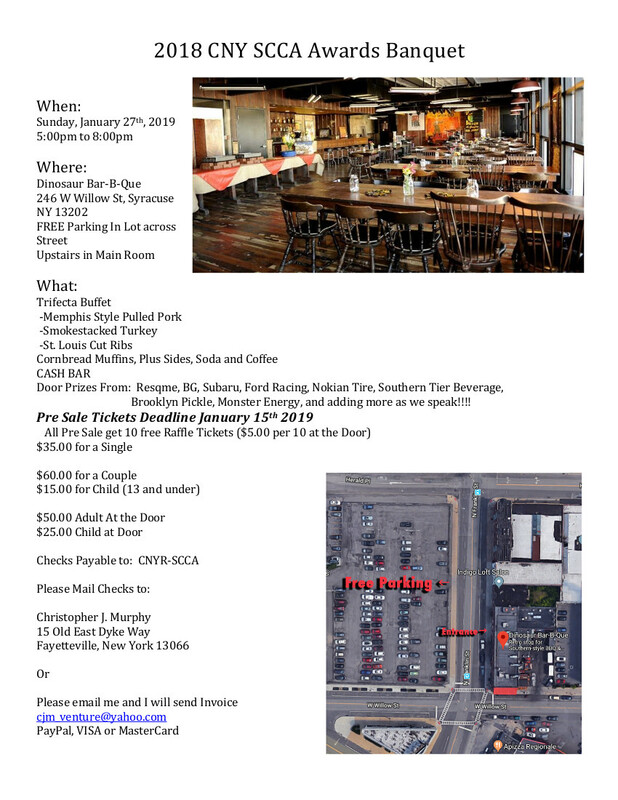 Door Prizes From: Resqme, BG, Subaru, Ford Racing, Nokian Tire, Southern Tier Beverage, Brooklyn Pickle, Monster Energy, and adding more as we speak!!!! We have added an a new out-of-region event with the FLR region on 10/1 at their Xerox location. Our April 30th Solo Event has been cancelled. You can read more about this on our Facebook Page. Assorted Cheeses with Crackers, Fresh Fruit Bowl, Assorted Vegetables with Ranch Dip, Fresh Dough Pizza Strips and Caesar Salad. $25.00 per person. $40.00 a couple. Children 16 and under free. Tomorrow's Rallycross (March 26th) has been rescheduled for April 3rd. Congratulations to all of our winners of awards for the 2015 season. Our solo program is looking for donations to help offset the cost of a new solo trailer. Our old van is no longer roadworthy, and a replacement must be found for future solo events. As such, we have created a GoFundMe page for accepting donations. Our Region is listed as a 501(c)(3) organization. Always consult your tax expert regarding which donations are tax deductible. Happy holidays everyone! I hope we all get a new Ford GT under the tree. Anyways SAVE THE DATE. Hello All! It was a great season. Now it’s time to brag. Awards banquet to be held on Jan 24th 3-7 at Borios on Oneida Lake. More info to follow. Spread the word.